I thought I would put up one last picture in case I’m not able to leave another post before the new year. 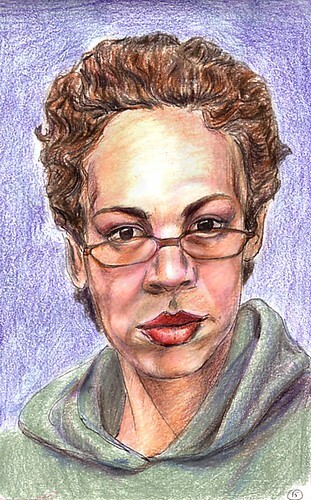 I did a self-portrait with colored pencils. It relates to one of my resolutions listed below. Now for resolutions for 2008. If I had a dollar for every resolution that I followed through on I wouldn’t have enough money to catch a city bus. But I keep making them every year just the same. I’ve been thinking about my drawing goals for the coming year. Draw more from life. I have had a lot of success these last couple of months with drawing from life. I definitely want to keep that going. Pay attention. I’ve been thinking a lot about how little attention I pay to things. Doing the Everyday Matters challenges has really opened my eyes and it’s really helped to improve my drawing. Use color. I’m frankly just cowardly about drawing in color. I tried the color pencil portrait above, but I felt so uncomfortable. I want to get some watercolors and just make a lot of mess. I can resolve to make at least one color drawing a month. A puny promise, but easy to keep. What kinds of art goals have you made for 2008? Feel free to leave a comment and let me know. I’m very curious. Thanks for visiting and please come visit again! Lovely self-portrait. Can’t wait to see your work progress, especially playing in watercolor. My 2008 goals are ready to be posted this weekend – I think. Well, you could go for the colored pencils that are water-soluble, to meet yourself halfway! Looks nice to me. I like your confidence of lines. This is great. I understand about being uncomfortable but the results to me were well worth it!! Shirley, Darla, Genine: Thanks for your comments. Shirley: I have your blog on my blogroll. I look forward to seeing your goals there. Darla: I definitely should try the water-soluble pencils. It gives me a little more control and would help me to ease into watercolor. I’m so glad you like my portrait. Genine: I’m glad you like the pic. I love your selfportrait! I think you did great with colour, nice and expressive. I always have resolutions for a whole week after I made them, so if I could just receive my dollar for each I keep in that week, I’d be comfortably rich! I like your drawing style, and your blog. It’s inspiring to me since one of my art goals for 2008 is to draw more, just for fun. I doodle and sketch out my ideas, and want to really explore them more in drawings. I love your phone drawings! Ronell, I’m glad you liked the self-portrait. Happy Blogging in 2008. You are one of my favs. Kris, thanks for visiting. I hope you stop by again. I’m pretty sure you can tell I liked it! I really like your self portrait! Great use of color and so expressive, you did a wonderful job. I enjoy seeing all your work here and look forward to what you’ll do in 2008! wonderful drawing. very insightful. I get the edm digests even tho I’m not very active at the moment. This drawing was so beautiful that I had to comment. Best to you in the coming year! You can´t tell from your drawing that you feel uncomfortable with colours. I think it´s a great drawing, fantastic! I like your art goals too, the fact that they are quite few, I think you are going to succeed in sticking to them. Making too many plans usually makes me fail in keeping up with them all… I´ll be posting my art goals for this year in the next few days, just have to think some more… Thanks for sharing! Malcolm: Thanks for featuring my drawing on your blog. Ann: Thanks for your kind words. Your colored pencil drawings are fantastic. I really like your Purple Cone Flower and the Looking Up landscape. I would love to be able to use color like that. starrgrl: Thanks for your comment! It’s nice to start the new year with such praise. You make me blush. My best to you for the coming year as well. nina j: Thanks! I’m glad you like the drawing. We’ll see if I can stick to those resolutions. I do know that I will definitely put more effort into drawing with color. Happy New Year! fabulous drawings and such an expressive SP….great work !!! Thanks Kim for adding me to the list and for your lovely comments. Thanks PamYla . I’m glad you liked the drawings. I will be posting again soon. Wonderful, vivid colors in this. I like it! Wow, I saw this portrait before and didn’t realise when you commented on my blog that it was yours! You have no problem with colour, this is wonderful! Thanks a lot. I’m slowing beginning to work with color. Your comments boost my confidence. Your drawing is fantastic and I like with colors too, both it´s very expressive! Thanks. I’m so glad you stopped by. I am into the habit of doing mine every few months to see the progress of my changes. Or shoudl I say the “decline”? I record them in the hope I will have a progressive view of how I saw myself in the past. It never reflects who I am , but rather, has many ingredients of how you feel that day about myrself. Loved the drawing!